For Zach's birthday, I wanted to take him somewhere special that wasn't too expensive and was still in close proximity to the theater we were going to later. After hearing such great things about Proof over the years, we had talked about trying it out sometime and this seemed like the perfect opportunity. 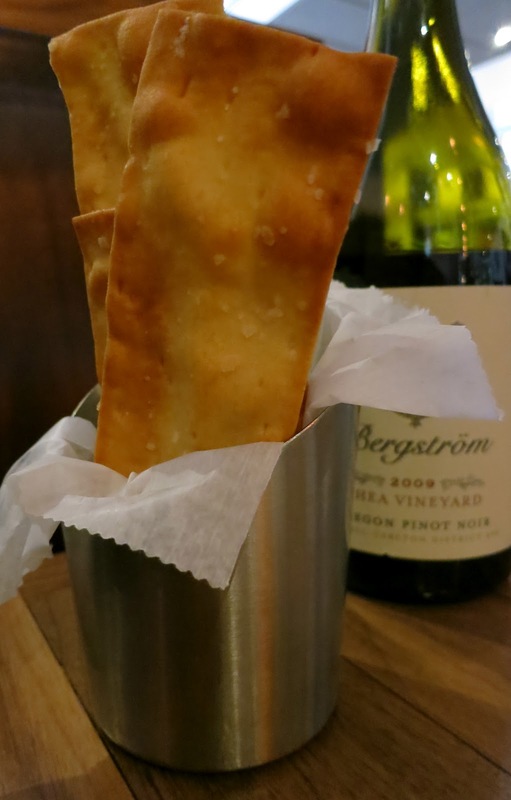 Even more than its cuisine, Proof is known for its outstanding wine selection boasting 1,000 different bottles and over 40 by-the-glass selections. Led by Chef Haidar Karoum, the cuisine is also known to be stupendous. On this particular Saturday night, we had an early 5:30 p.m. reservation so we'd be sure to make the theater on time for the show. As soon as we sat down, we were handed the wine selection. This 50-page book was very overwhelming showcasing wines from the New and Old World. 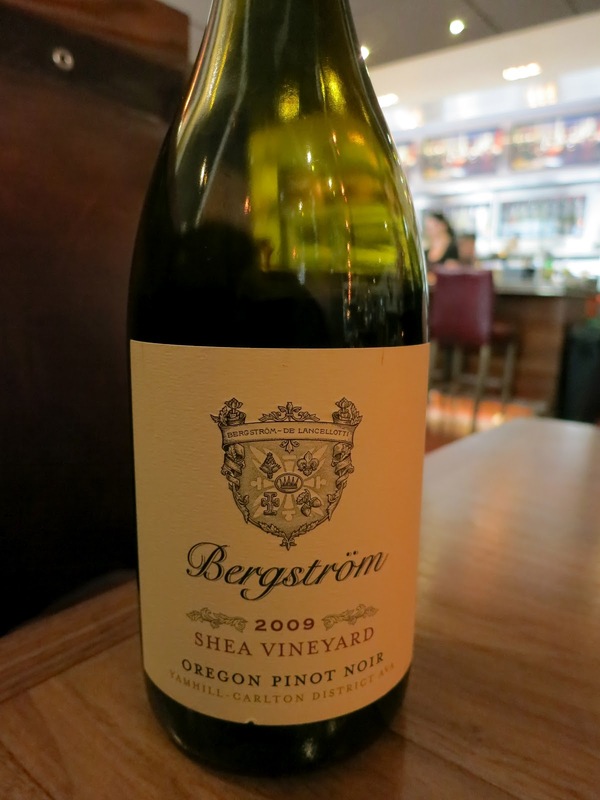 We spent about 20 minutes just trying to decide on a bottle and eventually chose the Bergstrom Shea Vineyard Pinot Noir (2009) from Willamette Valley, which we absolutely loved. Proof has a great selection of modern American cuisine, but only offers one vegan entree. I knew this coming in and had contacted the chef ahead of time to see what our options would be as far as appetizers and sides. He said that the salad of local frisee, roasted beets salad, and butter crunch lettuce salad could all be made vegan. They would also be able to change the vinaigrettes to avoid the honey. Additionally, three of the sides -- the grilled ramps, Brussels sprouts, and broccoli, could be made vegan. So, I felt comfortable knowing there were some options. They started out by serving some bread with some sort of dairy sauce. One bread was not vegan, but the flatbread was so I ate the crispy flatbread while deciding what to order. Zach wanted to order the vegetarian gnocchi, which was not vegan, so I started with the tempura instead. Tempura is not that exciting as you can find it anywhere, but I found this tempura to be particularly good. There were wild mushrooms, French beans, red peppers, asparagus, and eggplant all cooked to perfection in tempura batter. But, it was really the sauce that brought the flavors out. The lemon-truffle dipping sauce made with daikon radish really brought out the flavors of the vegetables. The wild mushrooms, in particular, were amazing. As we were waiting for our entrees to come out, I admired the decor. On one side of the restaurant, there was an exposed brick wall on which gold framed mirrors were hung. Along the wall were large booths and throughout the restaurant there was ample seating for patrons. There was an amusing sign leading to the restrooms that illustrated a man peeking over the stall at a woman that Zach found disturbing. I found it to be quite funny. At the bar, I noticed that all of the wine bottles were kept refrigerated in a a stainless steel Enomatic machine from Italy that allowed the staff to dispense wine into a glass without removing the bottle from the refrigerated area. It was very cool. On the screens above the bar, Proof pays homage to the Portrait Gallery across the street by displaying images from the museum's collection on flat-screen plasma monitors. After a little bit of time, our entrees were served. We both ordered the Napolean as that is the only vegan item on the menu. It consisted of vegetables sandwiched between two layers of crispy fried tofu and topped with crispy mushrooms. The tofu was firm and elegantly prepared so much so that I inquired as to how it got its consistency. I was told it was pressed, then vacuum sealed to get all the water and air out. Interesting. The broccoli, bok choy, and carrots were steamed while the Hen of the Woods mushrooms were fried to a crisp. It was topped with a sweet chili-garlic sauce. This dish was very good. But, while the entree was very good, it certainly wasn't mind-blowing, which is really what I was expecting from Proof. Everything we had had an Asian twist, which really isn't novel in the vegan world. We inquired as to whether they were considering adding more vegan options and it didn't sound like they were as there are only eight entrees on the menu and apparently only one can be vegan. All in all, the service was spectacular, the wine was exquisite, and the food was good. Next time, we may just come for drinks and appetizers though. The meal itself with wine was pricey -- in the end we paid over $200 including tip. If I am going to spend that kind of money, I can think of a few other places in the city I'd rather go. That said, I'm glad we went to experience Proof and certainly enjoyed the experience. If they were to offer a new vegan entree at some point, we would definitely return.